I’ve known Bill Self since his high school days at Edmond Memorial, when as a sophomore, he almost brought the Bulldogs back against Yukon in the 1979 5A State Championship game. What struck me about him then was his outgoing personality, unusual for most teenagers, and his thirst for knowledge about the game of basketball. Self was back in his old stomping grounds last night to pick up the Wayman Tisdale Humanitarian Award at the National Cowboy and Western Heritage Museum. He reminded me of his personal connection to the late superstar, having played with Wonderful Wayman for two years on the Oklahoma Rams, the outstanding AAU team that was dominant nationally in the 1980s. Self was a year ahead of Tisdale and the great Oklahoma class of 1982 that also produced NBA star Mark Price among others. He was a good but not great player at Oklahoma State, and he was savvy enough to keep building the basketball connections that would take him to head coaching stints at ORU, Tulsa, Illinois and eventually Kansas, where he had spent time as an assistant to Larry Brown. He is now considered one of the top five coaches in the NCAA and has won several national coach of the year awards. But picking up the Tisdale Humanitarian Award was something special for the Jayhawks coach and an honor that he was surprised to receive. Self and his wife Cindy, have been involved in numerous events that have raised money and awareness for many charities, making him a worthwhile selection for the award. I can personally attest to his willingness to get involved. Several years ago, he stepped to help me in a fundraising effort for Operation Breakthrough in Kansas City, providing signed memorabilia and making a radio appearance to promote the cause. Self has never forgotten his roots and still has many close friends in Oklahoma. 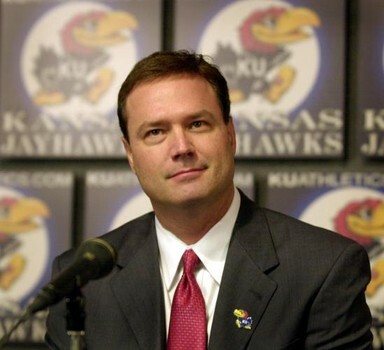 Still, he is firmly entrenched at Kansas, one of the storied programs of college basketball. As much as Oklahoma State fans would love to dream that Self would give that up to return to his alma mater, that isn’t going to happen in the foreseeable future – and maybe not ever.